Why The Fall In GBP Was Inevitable… And Why It Is Good. When Sunderland voted in June, we saw a 6% fall in the price of GBPUSD. The reasoning was that Sunderland surely wouldn’t have voted to leave since they were a Labour stronghold. Why was this inevitable? Essentially it’s due to something called the Balassa-Samuelson Theorem. Countries with high productivity growth also experience high wage growth, which leads to higher real exchange rates. The Balassa-Samuelson effect suggests that an increase in wages in the tradable goods sector of an emerging economy will also lead to higher wages in the non-tradable (service) sector of the economy. The accompanying increase in inflation makes inflation rates higher in faster growing economies than it is in slow growing, developed economies. 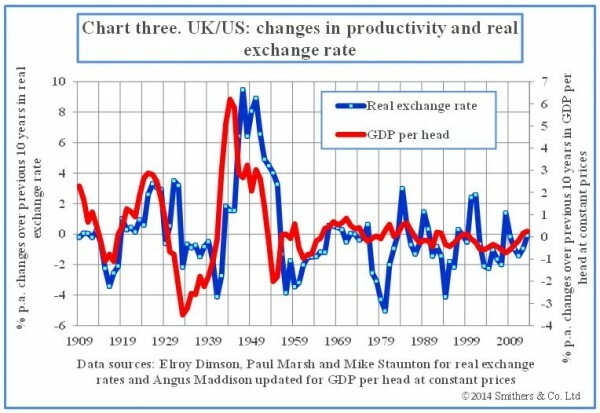 Over the years, UK productivity has slowed a huge amount relative to wage growth. This means that workers consume more than they can produce and this causes a decrease in the current account surplus (and eventually changes to a deficit, as we have now). 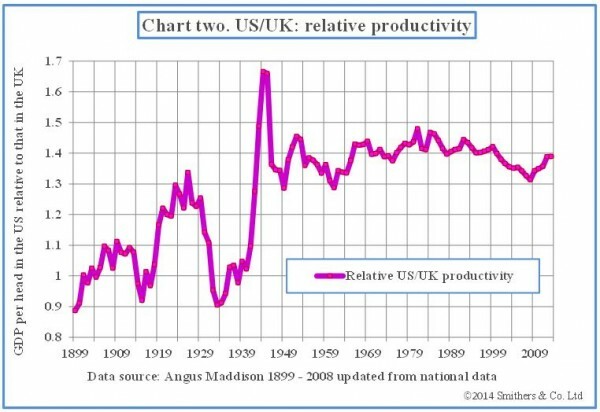 If the Balassa-Samuelson Theorem holds true (which it does when looking at the chart), then GBPUSD has been overvalued for a long time, based on the productivity discrepancy between the US and the UK. Why does having a lower sterling benefit? Well, you have a re-distributive effect where UK exports become more attractive. We currently have a current account deficit of £5.22bn. It widened heavily in September due to firms still purchasing amid uncertainty at a higher exchange rate price. Economic effects have time lags – monetary policy for example has approximately 6-12 months before it has much effect to the everyday person. Greater exports lead to greater tax receipts for the UK and an increase in the price level when looking at the aggregate demand relationship (C+I+G+(Nx) = Aggregate Demand, where C is consumption, I is investment, G is government spending and Nx is net exports) and a shift upward in aggregate demand equates to economic growth. Obviously short term price shocks will affect the pocket of the everyday person as the market is out of equilibrium and because the time lags are still at play. Adjusting for cyclical factors in the income balance, the IMF’s External Balance Assessment (EBA) models estimate that sterling is moderately overvalued in 2015. The 2015 CA balance is projected at -4.1 percent of GDP. If cyclical factors are removed, the EBA model estimates that the trade balance would improve by 0.3 percent of GDP. Based on the analysis above, staff estimates that the income balance will also improve by another 1 percent of GDP as cyclical conditions outside the UK improve. The underlying CA balance is therefore estimated at -2.8 percent of GDP. The EBA-estimated CA norm for the UK of -0.3 percent of GDP thus suggests a CA gap of 2.5 percent of GDP. Applying an elasticity of -0.23 (for the relationship between the current account and exchange rate) yields exchange rate overvaluation of 11 percent. The EBA REER index and levels regression estimate sterling overvaluation of 12 and 10 percent, respectively. Taking an average of these approaches and allowing for uncertainty suggests sterling overvaluation in 2015 of about 5–15 percent. I think what we take from this is that it is not the fall that has shocked the everyday person, but the velocity of the fall and how sterling hasn’t been given time to re-balance endogenous variables and find equilibrium. I do think that we should now expect a lower pound for the foreseeable future, however I can see an anchoring bias occurring where we have experienced rate upward of GBPUSD $1.45 for so long that people will always consider a rate lower as ‘bad’ without understanding that a high pound relative to the current account deficit that we have is even worse. This entry was posted in analysis, economics, Uncategorized. Bookmark the permalink. ← Are You Part Of The Sandwich Generation ? Enter email to receive updates to your inbox! Smart money: Nonsense, or something to pay attention to? Why is Trump about to have a huge headache?